Thought it was about time some more information was available about sloping in North Devon. Hopefully, we can make this a useful amenity for both local flyers and visitors. I have now done a bit more work on the site. Hope that it is useful for any of you guys wishing to fly round 'ere. I will be updating it and adding things when I can. makes me want some coastal flying for the weekend! good to see the sites! Is that website picture up on the downs looking towards Putsborough with Woolacombe behind? I went to primary school in Woolacombe and later moved to Chivenor, (Dad in Air Force) and loved every inch of the coastline - except Woolacombe in the summer! I've returned many times and flown most of the slopes you mention. I have never been with another flyer though! We almost bought a house there a couple of years ago but it fell through, as they do. The Home Page background picture was taken about halfway up Potters Hill looking down on Marine Drive. Putsborough is at the end of the beach - you can just see the caravan site that we fly over in the Winter. I'd just nipped up there, after work, the other week to maiden my Windrider Fox. It does get busy here in the Summer, but as you probably know, we work around it. I've updated some of the details and added a bit more to the site. Hope this is of use to anyone coming down here. Enjoy. Two new slope sites added : Welcombe Mouth and South Hole cliffs. Leave it with me and I'll try to alter the background image to enable the text to be more visible. Been flying at Welcombe and Hartland today. Awesome! Blowing about 20mph Westerley. Was able to fly about 400yds along Welcombe cliffs to the South of where I was standing ( where the picture is taken from) and managed to pull an inquisitive Peregrine off its' nest to have a look at my Wildthing - magic moment! Flew off Foreland Point the other day ( have added it to the site guide). I reckon this has to be one of the best slopes I have ever flown off - easily equalling St. Agnes for lift. Just maidened my Alula Evo in a 5 mph wind blowing onto the flood defence bank at Chivenor - can see I'm going to have fun with this one. Sorry to be 'on your back' but your site has vanished! Perhaps you are ammending it as I click? Excellent site Devon Flyer. Will look forward to heading up that way on a nice day. Can you tell me what slopes are not sutible for people with walking difficulties please. Is the green on black any better? Photo gallery added and some more information included in slope descriptions. Slopes now rated for ease of access and level of 'flyability'. You've produced some great research on local soaring sites. Dad and lots and lots of rellys lived in Woolacombe; my dear departed aunt and uncle used to run the woolacombe Post Office. Spent summers down on the dunes and 'up Morthoe' with various cousins in the 1960's. Having asked the question I missed the reply. Yes, green on black is much more visible. More slope access information posted and video gallery added. Check out our website (link in my signature), it lists most of the accessible sites. Whereabouts on Exmoor are you staying? If you want to come flying with us, just drop me an Email at the address on the website. North Hill at Minehead would probably be nearest to you. Works from SW - NE, I believe. Bit far up the road for me just for a quick session. I'm working in South Molton all this week, is anyone out after work this week as I've brought the Weasel and the Fusion for a play!!?? Thursday or Friday afternoon/evening looks best, at the moment, for this week. Saturday and Sunday looking good as well. Mortehoe is an ideal Weasel/Fusion slope and should be working well all days. I'll be out after work in Thursday? I'll let you know when we are going. Will probably text you on Thursday morning. Details of the Mortehoe site are on the North Devon Slopers website. 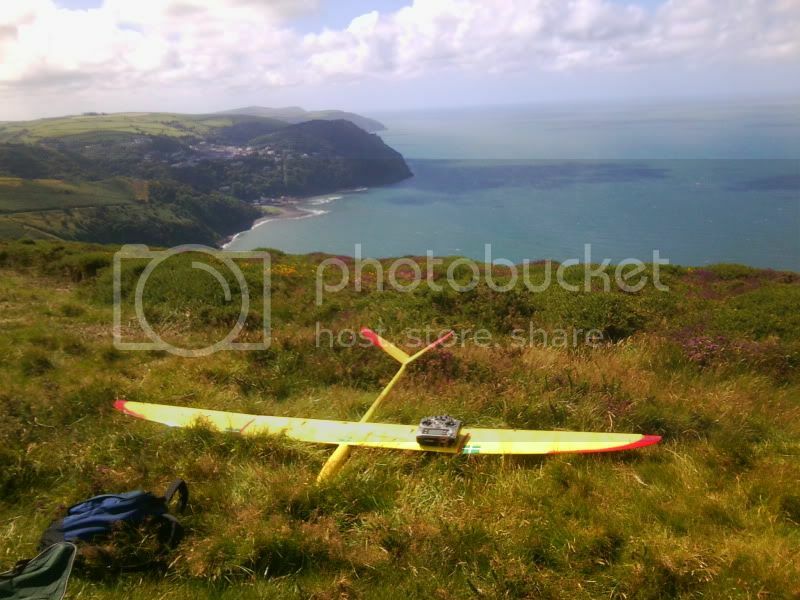 Ah, Mortehoe...flown it many times on holidays to Devon. Looks like Thursday might be a washout. Friday is looking better......................but we all know that can change. Maybe next week I'll catch up with you guys as head back to Cotswold on Friday. I'll be out for some flying around Barnstaple on Thursday evening if there's anyone around? I finish in the office in South Molton at 5 so could be at a slope around 5:30?? It will either be Mortehoe (SW) or Codden (SSW) on Thursday, if the weather holds. I've got to go up country on Thursday afternoon, so won't be around. Some of the other lads will probably be out though. Fantastic afternoons soaring in mega lift at Foreland Point. Every time I fly this plane, I just enjoy it more and more. You can fall out with some people, you know! Not much action from The Proper Cornish Slopers lot Mart...whats more no postings from Roger.....strange..?. Page created in 0.723 seconds with 84 queries.